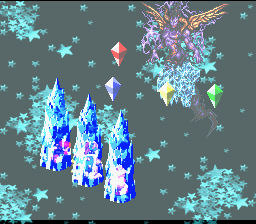 Solidify is an ice attack in the game Super Mario RPG: Legend of the Seven Stars that inflicts moderate damage to all party members. The animation for Solidify is three icy stalagmites that engulf their targets. Solidify is used by Axem Green, Culex, Domino, Exor, Hippopo, Magikoopa, Mokura, the Water Crystal and Valentina. Leuko will also use it as a counterattack. This page was last edited on December 19, 2017, at 12:56.